Relations between England and Spain broke down once again as King Charles I came to the throne. Failed plans for his marriage to a Spanish princess brought only humiliation and Charles subsequently declared war on Spain. His father, King James I, had left the country in a financial mess, and now it was Charles' chance to recapture some of that wealth – but his wars brought only death, disease, and deprivation to his naval port of Plymouth. In 1625, ninety ships and 10,000 soldiers mustered in Plymouth Sound, inadequately equipped and ill-fed. The monies raised to support the troops had been embezzled away by the naval administrator, Sir James Bagge, who lived at Saltram House. To make matters worse, plague raised its ugly head again, and Plymouth could not afford the cost of boarding all these men. Many of the soldiers were left starving and without lodgings, stealing just to stay alive. King Charles inspected his troops on Roborough Down in a carnival atmosphere, plumes waving over his beaver cap. However, he failed to notice just how ragged and rebellious his army was. Under the leadership of Charles' court favourite, the duke of Buckingham, the fleet sailed from the Sound. It sailed back in terrible disarray the moment the king departed, ships actually colliding with each other in the Cattewater. The fleet finally managed to get itself in order and sail again, but it was not prepared for the mission ahead: it was hugely deficient in both ammunition and stores. Moreover, the Spaniards had been secretly forewarned of the attack. The expedition was a failure. Many of the soldiers died of plague, food poisoning or exposure on the ill-equipped vessels. On the ships' return into the Sound, hundreds of putrid corpses were thrown into the harbour, and the narrow streets were filled with homeless soldiers, many wounded, and all stinking and diseased. Mass graves awaited them. The captains had to sell their stores to feed the sick, with no support coming from the king. James Bagge was vilified in parliament, accused not only of embezzlement but of plundering a French vessel in Plymouth Sound to line his purse. Rumours spread that the monies went to the duke of Buckingham. To protect his friend, King Charles I dissolved parliament to prevent his impeachment. Plymouth joined parliament in their censure of the king and his allies. Buckingham then led a force to defend their Protestant allies, the Huguenots, at La Rochelle, under attack from the French, but it was another disaster. The ill-fed and diseased soldiers mutinied in Plymouth, and rebelled again when one of their number was sentenced to be hanged, the mob tearing down the gallows. At La Rochelle, as the ill-equipped English were forced to retreat, thousands drowned. Around 3,000 men, over half the expedition, were killed, and Buckingham's popularity plummeted to an all-time low. Again sick and wounded men were brought to Plymouth. 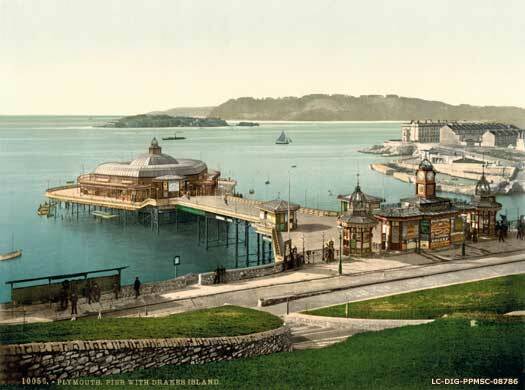 The council issued an order to try to prevent them landing in Plymouth, but still the diseased men were brought ashore. The crew of the Amersfoot, a Dutch vessel moored in Plymouth Sound, were charged with barbarous cruelty. They watched and followed a group of English shipwrights leaving work at the Cattewater dock and then attacked them with swords. The fighting swelled as Dutch sailors and English dockmen joined the riot with pistols and cutlasses. One onlooker was knifed to death. When challenged by the mayor, the Dutch cried that their attack was in response to the failure of King Charles I to keep his word with Holland. The king's foreign policies were tearing Plymouth apart. 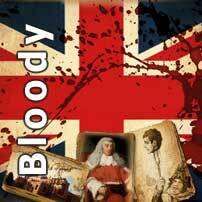 Read all about the bloody history of your local area in Britain in this gory section. 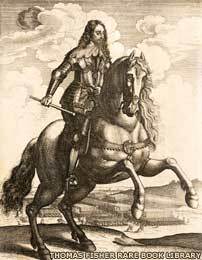 Battles between parliament and the monarch came to a head in 1642, and civil war was declared. Cornwall sided with the king, while Devon sided with parliament. At first the administration at Plymouth was Royalist, under Governor Astley. However, the king made the terrible mistake of calling Astley to join him as a major-general in the Royalist army. The moment Astley departed, Mayor Francis and his Puritan allies took charge of Plymouth and declared it for parliament. 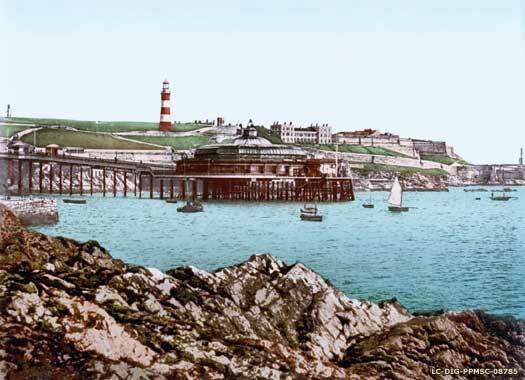 Although the rest of Devon and many ports around the country fell to Royalist forces as the war progressed, Plymouth remained the only port for parliament throughout the Civil War, fiercely defending itself against the king in years of siege and hardship. By 1642, Plymouth was a strongly walled town, with the fortifications built in the time of King Henry VIII still present on every headland around the Sound. The mayor decided that an outer line of fortifications was necessary, along the natural northern ridge that runs west to east from the old Stonehouse Creek to the north of Mill Bay, to Lipson and Tothill – a line of about 6.4 kilometres (four miles) that forms a crescent around the town. Every man, woman and child was forced to work to build the fortifications, digging trenches, building earthworks, and supplying the soldiers with ammunition, food, and drink. 'strong drink' was provided for when the fighting got bad – and it got bad. Every man in Plymouth signed an oath to die in defence of the town rather than see it taken by the king, and as the Royalists took Devon, the people grew ever more desperate to defend themselves. Rumours circulated of what happened to the inhabitants as other besieged towns fell to the Royalists – horror stories of children slaughtered, women raped, and men sold into slavery. These may have been exaggerated, but they also contained a kernel of truth. 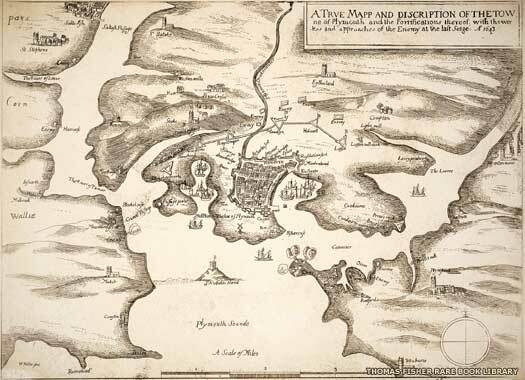 Soon the Plymothians were hemmed in by Royalist troops at Saltash, Plympton, and the headland now called Mount Batten, and Plymouth became increasingly isolated. Refugees from across the south-west, fleeing the king's forces, arrived in great numbers in Plymouth, swelling the already overcrowded town to a population of 10,000. Living conditions inside the town soon became unbearable, with only the port able to supply food and fuel to the trapped inhabitants. The king's men blocked the leat from Dartmoor that provided Plymouth with its fresh water, and plague and typhus soon flared up. Firewood became unobtainable. Yet they refused to surrender. When a Royalist trumpeter arrived at the town with a request from the king's forces for their surrender, he was whipped, beaten, imprisoned overnight, and then sent back with instructions never to visit the town again. Plymouth was populated by men of military expertise and daring, often fuelled by Puritan passions. Repeatedly they led enthusiastic raiding parties beyond the line of forts to take on the Royalists. Aware that the Royalists had established their headquarters at Modbury, east of Plympton, Colonel Ruthven, a Puritan of the Plymouth militia, mounted a bold plan. Ruthven took three hundred mounted men north and then east, circumventing the motley Royalist army in Plympton and, in the mists of dawn, took the Modbury headquarters by complete surprise. With swords and pistols, Ruthven's men charged on Modbury, hitting the Royalist command post with such force that the nine hundred Royalists posted there immediately scattered. The Royalist senior officers, holed up in a local mansion, surrendered when Ruthven ordered his men to set fire to nearby outbuildings, the flames and smoke heading for the main house. While Ruthven's fervent Puritans desecrated the local church, removing all 'heretical' images and iconography, the Plymouth forces captured the senior Royalist officers. Ruthven's genius was then to draw the remaining Royalist army – regrouping now for a counter-attack – to follow him east to Dartmouth, while the majority of the prisoners and Ruthven's men actually travelled west to Plymouth through Plympton. Splitting the party had the Royalists fooled, and Plymouth triumphed with the largest cache of Royalist senior officers ever captured. Over the four years of the siege there were many of these little victories, but the greatest victory for the Plymouth forces was to come with the Sabbath Day fight. Prince Maurice – nephew to King Charles I and a man renowned for his atrocities against civilians in the wars in Europe – had been put in charge of breaking the siege at Plymouth. To defend their eastern borders, the Plymouth forces had built a new earthwork called Laira Point, overlooking the tidal Laira Creek which ran into the Plym. Laira Creek ebbed and flowed through a deep valley on the other side of the steep north-eastern ridge, but Prince Maurice saw this as a suitably weak target to break the siege. He couldn't have chosen a worse location to attack. The Royalists, spurred on by their triumph, charged west to take the town, but the Plymouth forces unexpectedly regrouped and 'swept all before them like a roaring torrent'. The king's men retreated, only to discover that the tide had turned behind them and now the Laira Creek was impassable. Trapped against the deepening rush of water, Maurice and his men floundered on the ridge overlooking the Laira, their horses plunging into the mud, riders riddled with shot from the attacking Plymouth forces. Hundreds of the Royalist died, drowning, sliding down the steep embankments into the muddy waters. At this point they were also targets for the ships still in the Plym Estuary and many of the king's men fell into the hands of the Plymouth fighters. For many centuries, Plymouth's victory – the 'Great Deliverance' – was celebrated on 3 December, and with a commemorative monument at Freedom Fields. In disgrace, Prince Maurice moved on, and in 1644 Sir Richard Grenville was appointed to oversee the siege on Plymouth. Again Sir Richard tried to intimidate the town into surrender, but his words were met with scorn. He had arrived late in the English Civil War after brutally attacking the rebellious Catholics in Ireland. Initially Grenville had declared himself for parliament and had been appointed to lead an army to attack the king, but at the last minute he changed sides, taking his forces – and parliament's money – with him to join King Charles. Grenville was branded the worst kind of traitor: a turncoat, 'skellum', and a rogue. Grenville proved more sadistic and corrupt than even the Plymouth leaders could have imagined. Grenville became a war profiteer, kidnapping rich men in Devon and holding them in the horrors of Lydford Gaol until their families paid a large ransom; he thereby amassed a personal fortune in land and money. One story is particularly famous: while travelling between Plympton and Tavistock, Grenville and his party came upon four Plymouth soldiers gathering wood. Rather than take them prisoner, Grenville forced one of the Plymouth soldiers to hang each of his company from the nearest tree. Grenville then hanged the last man himself. Throughout the English Civil War, the gaol on St Nicholas' Island (now called Drake's Island) was used to imprison Royalist dissenters and traitors. After the Restoration, it was the turn of the anti-Royalists and nonconformists to be imprisoned there. One such was Abraham Cheare, who was a pastor of Plymouth's nonconformist church and a victim of the religious intolerance that hounded Plymouth's inhabitants. In 1661 he was sent to Exeter Gaol, charged with 'encouraging religious assemblies'; he was then released in 1662, just as King Charles II removed two thousand religious dissidents from their parishes (including the preacher for St Andrew's church in Plymouth). 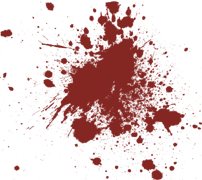 Cheare was imprisoned again in Exeter for holding unlawful assemblies. The conditions in Exeter Gaol were appalling and he spent many hours writing to his congregation telling them how he was relying on his faith to survive. His sister finally secured his release in 1665, but his return to Plymouth brought him back into the hands of his enemies, and he was held in the noxious prison near the Guildhall for a month before being banished to St Nicholas' Island, where he soon fell ill and died, aged just forty. By January 1645, Grenville had had enough of fighting skirmishes with Plymouth's forces and launched a full-scale attack – with over six thousand of the king's men – against the central forts along the line. But the weather saved the city. The weather in Plymouth is notoriously wet in the winter months, and in January 1645 it didn't just rain – it rained for two days, a torrent that filled the ditches with water and made earthworks into mud. Again and again, Grenville sent in his forces to take the earthworks at all costs, only for his men and their horses to drown, sucked into the mud. When one of Grenville's own officers protested at the useless loss of life, Grenville ran him through with his sword. A strange ghost from the English Civil War still haunts the Mount Gould Hospital, located near the line of forts once attacked by Prince Maurice in the Sabbath Day fights. After many strange occurrences, one male member of staff reported seeing a white lady in a patient's room. As he watched, the white lady disappeared through the wall. Though the patient in the room was well that day, he was dead by morning. Royalist cannon thundered through the night and at last Grenville's forces managed to take two of the forts along Plymouth's line of defences. However, Plymouth's soldiers battled on and killed sixty of Grenville's men at Maudlyn Fort, turning Grenville's own cannon against the oncoming Royalists. At the fort of Little Pennycomequick, Grenville's men launched a trap: they somehow managed to take the fort, silently slaughtering every man inside. Then, quietly, they lay in wait, poised for their moment to take the town. But a Plymouth officer called Birch, approaching Little Pennycomequick, realised that the stillness inside the fort was not a good sign. He calmly approached the structure and someone within cried, 'Stand, who are you for?' Birch replied, 'for the parliament' – and the rain of gunfire that responded told Birch the fort was taken. He instructed his soldiers to wait for Grenville's men to fire off their pieces. Then, while they were reloading, Birch and his men charged the fort. Hand-to-hand combat left the fort's walls and floor soaked in blood – and Plymouth victorious yet again. Images and text copyright © The History Press and author(s). This is an excerpt from a History Press publication produced with permission and in conjunction with the History Files.